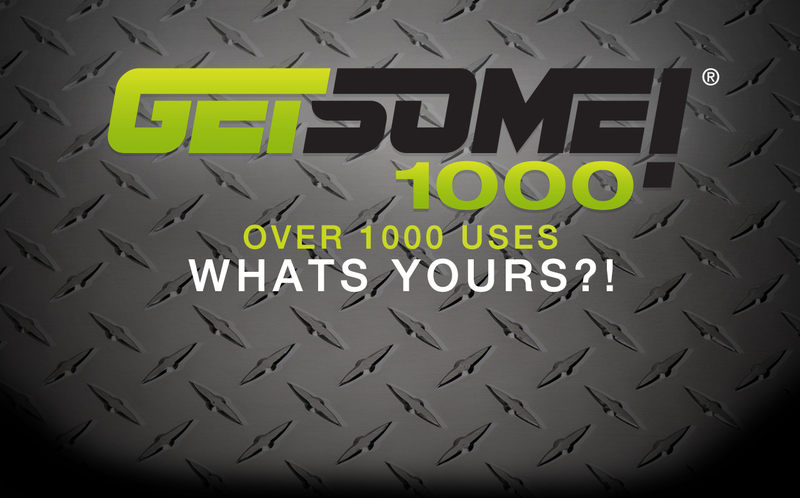 GETSOME 1000 contains no silicones, acid, kerosene, or dieseline. GS 1000 will not harm metal points or surfaces, plastics, paints, enamels, fiberglass, Formica or neoprene seals. GS 1000 does not dry out, gum up, become gooey or sticky or wash off with water. GS 1000 is non-conductive, non-static, non-toxic, non-corrosive and non-staining, non-halogenic, non-carcinogenic. GS 1000 is a High Quality Lubricant designed with Food Grade quality machine oils and industrial grade anti-wear and anti-corrosive, anti-moisture additives. What makes GS 1000 different to other WD type sprays? GS 1000 is made using a high grade machine oil base, contains no silicones, acids, kerosene or dieseline. Most WD type prays use kerosene or solvent bases. Therefore WD products tend to evaporate quicker. GS 1000 has a LOW VOC. Is GS 1000 safe to use? GS 1000 has no toxic additives. It is made with Food Grade Quality ingredients and contains no carcinogens. Why is GS 1000 superior? GS 1000 has a 1000 PLUS uses. Multi-Purpose, Multi-Uses, Safe enough but Strong enough to use from baby buggies to bull dozers. Replace all your old sprays with GS 1000 and GET IT DONE! What are some of the most common everyday uses for GS 1000? Can GS 1000 be used as a polish? Why is GS 1000 a better lubricant around the home? GS 1000 doesn’t gum up, become sticky or gooey, Does not dry out or wash off with water, other WD type sprays because of their solvent base tend to evaporate quickly, where GS 1000 because of its lubricating oil base will last much, much longer. LOW VOC. GS 1000 will keep door locks, hinges, sliding doors and windows working for much longer than WD type sprays. . Skate boards and roller blades, bike chains, garage door rollers, .etc working like new for months on end. Can GS 1000 be used as a Penetrant? GS 1000 will readily penetrate the severest of corrosion and free up nuts, bolts, screws, threads, pins, bushes. Bearings, and parts from rust and corrosion and help keep them in good working order. GS 1000 hydraulics extremely well because it is engineered with high quality machine oils and industrial penetrating additives. Can GS 1000 be used for sporting goods? GS 1000 for guns- Cleans, Lubricates and Protects ALL IN ONE. Penetrates and Cleans built up carbon, and removes surface rust. GS 1000 will not harm bluing, metal finish, wood or plastic stocks. Lubricates all mechanical parts of gun-trigger, extractors, springs… Will not evaporate, gum up or turn gooey under firing conditions, reducing friction, wear and galling. Protects against moisture, condensation build up, and surface rust. Will not affect primer or deaden ammo, because GS 1000 contains no solvents. GS 1000 has no perfume or masking agents, therefore there is no residual odor to effect hunting conditions. GS 1000 creates a micro bearer on the gun to protect against rain or moisture. Sporting applications include pistols, semi and full auto rifles, and shotguns, golf clubs, BMX and motor bikes. Go karts, boating(power and sail), off road vehicles. Can GS 1000 be used on power tools, hand tools, welding equipment? Can GS 1000 be used around the yard and in the garden? GS 1000 can be used to lubricate and clean wheel barrow wheels. Pruning shears, chain saws, garden tools, all lawn mowers and weed eaters. GS 1000 helps stop grass clippings from sticking to the underside of mowers. Use GS 1000 on pruning sheers or hedge trimmers-GS 1000 will not turn the fresh cut shrubs brown. Use GS 1000 to protect and lubricate children’s play equipment and swings, pool pumps, gate, latches, locks and hinges. GS 1000 is non toxic and safe. What application does GS 1000 have in Marine? Where can GS 1000 be used on CARS? GS 1000 lubricates and frees door locks and hinges, control cables and linkages, starts wet motors. Free up nuts, bolts and parts frozen with rust and corrosion (exhaust manifolds and pipes, suspensions, etc) Clean and polishes vinyl dashes and upholstery. Spray across the front of vehicle when traveling long distances at night in the country, it will make it easier to remove bugs and insects the next day. Clean and remove road tar. Protect the under carriage and motor area with GETSOME Extreme. Do not spray onto exhaust system, because it will smoke, when parts get hot. Does GS 1000 have a commercial application? Does GS 1000 have a farming application? GS 1000 to lubricate and protect from corrosion, PTO splines and couplings, sprockets, chains, irrigation motors, windmill gears and linkages, electrical systems, starter motors, generators, alternators, relays, solenoids, battery terminals, shearing hand pieces, overhead gears and drive shafts, winches, and cables. Frees up corrosion and rust frozen parts, track and blade bolts, exhaust systems, nuts, bolts, pins, bushes, & pin bearings. Does GS 1000 have a transport application? Use GS 1000 to lubricate and protect air brake slack adjusters and linkages, roller doors, side curtain tracks, door locks and hinges, air and electric start motors, wiper motors and linkages, alternators, and air horns. Use GS 1000 to protect and give longer life to brake, tail and clearance lights, relays, battery terminals, solenoids, wiring, electrical and air hose connectors. Use GS 1000 for repair and service work on fuel injectors and pumps. What is the shelf life of GS 1000? Indefinite. While some products may have an expiration date, GS 1000 lasts so long that a “use by” date isn’t necessary. When bulk product (e.g., gallon) sits for an extended period of time, the product may separate. This will readily remix upon agitation. What does GS 1000 contain? While the ingredients in GS 1000 are secret, we can tell you what it does NOT contain. GS 1000 does not contain silicone, kerosene, dieseline, petroleum distillates, acid, water, graphite, PTFE, halogens, carcinogens or chlorofluorocarbons (CFCs). How long does GS 1000 last after application? While this may vary depending on the application, GS 1000 remains effective much longer than WD type products because it does not evaporate like kerosene or solvent based products. The corrosion and rust protection ingredients remain adhered to the surface longer providing long lasting protection. External conditions may, of course, require additional applications of the product for maximum protection. Is GS 1000 different than MOST Lubricants? GS 1000 was engineered, designed and with the highest quality machine oils and additives. GS 1000 was designed to Lubricate, Penetrate, Protect against Corrosion and Displace Moisture. GS XTREME is a HEAVY DUTY ANTI CORROSIVE Product designed for the professional users to protect against EXTREME moisture and corrosion. What does GS 1000 Product do? 1. LUBRICATES: The product’s lubricating ingredients are widely dispersed and tenaciously held to all moving parts. 2. PENETRATES: Loosens rust-to-metal bonds and frees stuck, frozen or rusted metal parts. 3. PROTECTS: The product protects metal surfaces with corrosion-resistant ingredients to shield against moisture and other corrosive elements. 4. REMOVES: GS 1000 gets under dirt, grime and grease. Use it to remove gunk from tools, equipment and vehicles. GS 1000 also dissolves adhesives, allowing easy removal of excess bonding material. 5. DISPLACES MOISTURE: GS 1000 quickly displaces moisture to eliminate moisture-induced short circuits in electrical systems. What surfaces or materials are OK to use GS 1000 Product on? GS 1000 can be used on just about everything. It is safe to use on metal, wood and plastic. It can also be applied to painted metal surfaces without harming the paint. GS 1000 may cause low grade rubber to become sticky during long term exposure. What about using GS 1000 on my sports equipment? GS 1000 is safe and effective to use on all types of sporting goods. It is a fantastic all-around maintenance product for bikes, as you can use it on frames to prevent them from rusting, to lubricate pivot points, to prevent mud from sticking and to displace moisture from bike components. Use GS 1000 on watercraft to drive out moisture and to protect metal surfaces from corrosion. What is the propellant in GS 1000? A propellant is the stuff that helps pump GS 1000 out of the aerosol can. The propellant used is a mixture of iso-butane, which is nontoxic to the environment, a similar gas for what you would use to cook a steak on a gas grill. It is an inert gas which helps empty the contents of the can. Used for thousands of applications, GS 1000 cans have a groove in the black cap to hold the straw when not being used. Just snap the straw into the recessed groove on the top of the black cap and it will stay until you are ready to use it again. No more lost straw! Where can I buy GS 1000? OUR GOAL is for GS 1000 to be available almost everywhere. It can be found in many countries in automotive, motorcycle and bicycle shops, hardware, marinas, hobby, home center stores. It’s also available from leading distributors all over the world. If your store or distributor doesn’t sell GS 1000, please ask them to add it or call us to GETSOME! Does GS 1000 Products Company offer sponsorship opportunities? Getsome Products does not have a formal sponsorship program at this time, but tries to accommodate most product requests from racers, car clubs, and tournaments. We know a little GS 1000 can go a long way, and wish both new GS 1000 fans and those who have been sponsored by GetSome Products in the past the best of luck in their endeavors.